Lake McConaughy, the largest body of water in Nebraska and it has the largest bird list of any location in the state, including about 340 species, with 104 known breeders, 17 additional possible breeders, and about 200 transients birds. The large water area attracts large numbers of migrant waterfowl, grebes (especially western grebes), gulls (including many rarities) and shorebirds. A good spotting scope is needed to cover this vast reservoir, but many of the waterfowl congregate near the spillway during winter, or (in the summer) toward the western end of the lake near Eagle Canyon Hideaway and the Clear Creek Wildlife Management Area. Large numbers of bald eagles also build up in winter, attracted by dead fish and the wintering duck and goose populations. A eagle viewing heated building is below the spillway. Well over 100 miles of shoreline are present along the lake, with the southern shoreline rocky and steep, and the northern shore sandy, support nesting piping plovers and least terns. Eagle Canyon Hideaway is located on the Western end of the lake near the 2,500-acre Clear Creek Refuge. The low meadows support nesting bobolinks and probably breeding Wilson’s snipes, and the tall tree groves hold many breeding passerines. White pelicans (non-breeders) are common, and least bitterns occur. This is one of the state’s best birding areas. Barn owl nest cavities usually can be seen in the cutbanks at the turnoff from Highway 22; nests in this part of the state are usually in self-excavated sites rather than in old buildings. 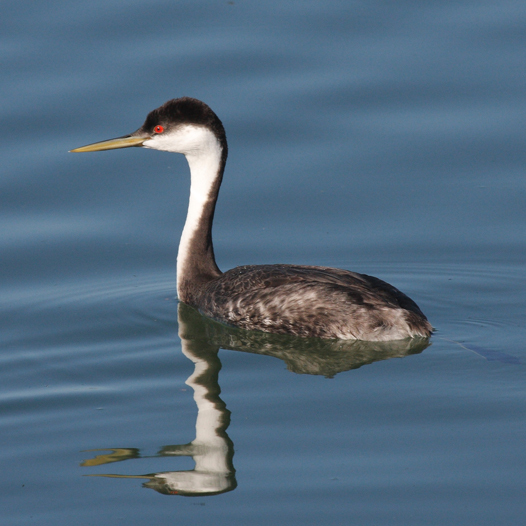 This end of Lake McConaughy is the state’s best documented nesting area for Clark’s grebe. Located at the west end of Lake McConaughy right by us.